Image Source : AP A file image of Dinesh Chandimal wearing a mask during the 3rd Test in New Delhi. Sri Lanka captain Dinesh Chandimal today admitted that it was tough playing in pollution as his team was not used to it but decided to forget about the discomfort after a point and focus on the job at hand. "It was a tough time, the thing is, we aren't used to the pollution. That's why we struggled in the first two days," said Chandimal after the third Test ended in a draw. "We told the boys, we need to forget about it and play the game. Today was a fantastic day, felt like Sri Lanka. Thanks to the Indians fans too, thanks to Virat and team, wish them well for the tour of South Africa." In his defence, senior BCCI official Rajiv Shukla said the game could not have been cancelled due to pollution. "The match cannot be cancelled though pollution is everybody's concern. Nobody knew the situation would be like what it was before the game started," said Shukla. Delhi's viability as an international sports venue had been called into question after Sri Lankan players complained of breathing problems due to smog and wore anti-pollution masks on two days in the third Test. The second day's play in the match was halted for 26 minutes after the Sri Lankans complained of breathing problems, forcing Indian captain Virat Kohli to declare the innings at 536/7. 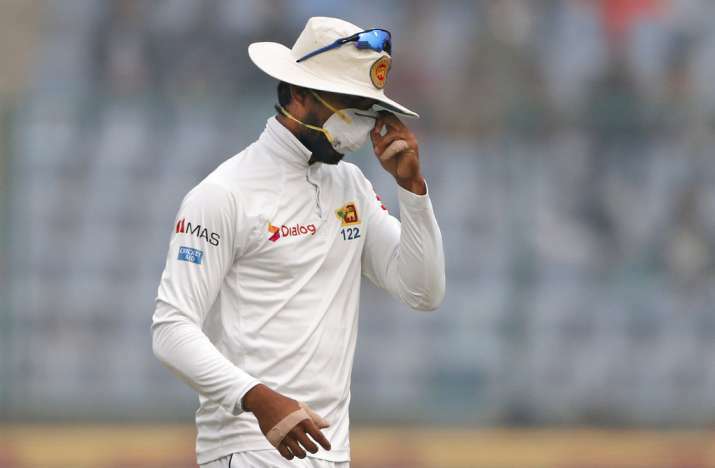 Yesterday the Lankan players wore N95 masks, required to protect the lungs from the poor air quality that has plagued the national capital for years now. Pacer Suranga Lakmal had a rough time on the field after bowling three overs. Fielding at third man, he started throwing up on the ground and was taken off.